Loredana Paracciani is an independent curator who has put up several exhibitions on Southeast Asian contemporary art both in the region and abroad. 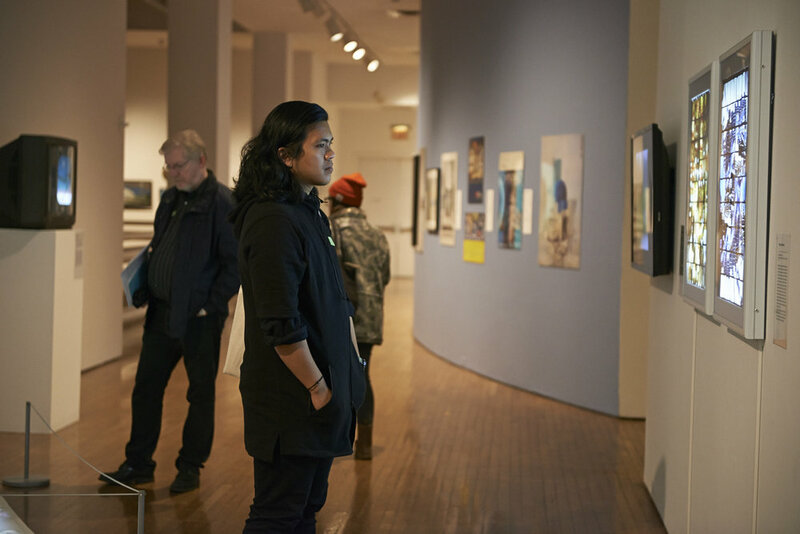 Recent shows include the current ‘Diaspora: Exit, Exile, Exodus of Southeast Asia’ (2018) at MAIIAM as well as 'Heads or Tails? Uncertainties and Tensions in Contemporary Thailand' (2017) at Sundaram Tagore Gallery in New York. A&M interviews Loredana to find out about her curatorial practice. Your research is focused particularly on contemporary art in Thailand, especially on younger artists. What do you think have been the changes in visibility of Thai contemporary art regionally and globally in recent years? There have been changes in visibility in the last 10 years, but these have been slow. To start with, there is usually little knowledge outside of Thailand about Thai contemporary art. For some reason, the general feeling is that it is still confined to the depiction of temples and pristine landscapes. While that may hold true in some instances, the contemporary art scene is actually vibrant and addresses the pervading social issues of present-day Thailand, a country that is experiencing a critical political situation. It is important to transmit these issues outside of the country so that the general public can become aware and understand how Thai society influences its visual art. The rise of biennales in Thailand should help, one hopes, in increasing the visibility of Thai contemporary art in this direction. 'The Game | Viet Nam by LE Brothers' (2016). Image courtesy of Jim Thompson Art Centre, Bangkok, Thailand. You've curated several exhibitions in Thailand, such as 'The Game | Viet Nam by LE Brothers' (2016) at Jim Thompson Art Centre, and 'Rituals: Ink, Oil, Cotton and Thread' (2018) at Nova Contemporary. What do you enjoy most about working in the country? I have been fortunate to work with a variety of art spaces in Thailand, from private museums, art centres like Jim Thompson Art Centre, to commercial galleries. Every space offers its unique potentials and challenges, but on the whole what I enjoy most is the people, artists, of course, but also the installers, designers, and all those involved in the preparation and presentation of the shows. It is truly an inspiring aspect of my practice to travel back to Thailand on a regular basis to conduct my research first and then to materialise the projects. What the infrastructure may lack in terms of state-of-the-art equipment is compensated with hard work, friendship and passion. The Thai art scene is relatively small, as an artist reminded me a while ago, but that is not necessarily a limitation since this particular situation should stimulate the spirit of collaboration and mutual support. ‘DIASPORA: Exit, Exile, Exodus of Southeast Asia’ (2018). Image courtesy of MAIIAM Contemporary Art Museum, Chiangmai, Thailand. Tell us about 'Diaspora: Exit, Exile, Exodus of Southeast Asia’ (2018). The show has been extended at MAIIAM till March 2019, and will in fact be on show for an entire year. What does the extension mean to you as curator of the show? The opportunity to work at MAIIAM has been very rewarding for me as a curator as well as on a personal level. The show took over a year to prepare. With Eric Bunnag Booth, who is the founder of MAIIAM, we worked closely to identify artists suited to the concept of the show and to select works that eventually would enter the MAIIAM collection — that was an exciting part. Along the way there have been challenges of course and opportunities to improve especially while dealing with such a difficult topic as displacement and mobility in Southeast Asia. Once we launched the show in March 2018 and the publication in May 2018, the museum felt the show was gaining momentum both locally and internationally so the decision was made to extend the show. I was honoured and delighted with the extension and so were the artists. The extension has given me the opportunity to work more extensively on the public programme which is crucial for any museum’s show. For instance, we held Jakkai Siributr’s storytelling workshop in November, and in December a special screening of the Singing Project by Taiwanese artist Charwei Tsai will take place. We are now also considering a closing event to coincide with the end of the exhibition in early March 2019. Could you tell us more about MAIIAM and/or working with Eric what you think is the space's importance to the Thai art landscape or even the Southeast Asian art landscape? Working with Eric has been a very positive experience, and I think this is a sentiment that many people that have worked with him would share with me. He is incredibly supportive of the growing Thai art scene, and he is encouraging especially with the young artists who are engaging with social and political issues through visual art. This channel of communication is important especially in this country, which is under military rule and suffers from limited freedom of speech. Art can serve as a platform to initiate productive conversation and MAIIAM as a museum offers precisely this opportunity. In addition, because MAIIAM is supported by private funding, there is the prospect of developing exhibitions and education programmes that need not fit any political and state agenda. You've curated single-artist exhibitions such as 'Yes' (2017), a solo show by Parinot Kunakornwong at Cartel Artspace and 'Asylum Seeker: The Pond and the Fireflies' (2016) at The Jam Factory in Bangkok, aside from several group shows. What are the unique challenges that come with curating a solo show as compared to group shows, and what do you enjoy about each of them? The challenges of curating solo or group shows are varied. Logistically, group shows may be slightly more challenging as they involve more works and coordination compared to one large body of works for a solo show like in the two cases you mentioned for which both artists produced entirely new works. Personally, I enjoy both solo and group shows, as each offers different and exciting dynamics, and opportunities to grow professionally along with the artists. As a curator, working on a solo show, one develops an intense relationship with the artist and this is very enriching. In a way, the curator becomes part of the creative process and this is an incredible position. In a group show the energy is very high as there are many artists each with his or her own personality. Ultimately in some ways we choose each other in the artist-curator relation, which is based on mutual trust and respect. ‘Architectural Landscapes : SEA in the Forefront’. Image courtesy of InToAsia Time Based Art Festival and the Queens Museum, New York. You have brought shows on Southeast Asian art outside of the region: 'Interlace: Three Artists in the Cambodian Diaspora', in Cube Arts, New York, United States (2016); 'Rev|Action: Contemporary Art from Southeast Asia' (2015) and 'Heads or Tails? Uncertainties and Tensions in Contemporary Thailand' (2017) at Sundaram Tagore Gallery, New York, and 'Architectural Landscapes: SEA in the Forefront' at the Queens Museum, Queens, New York, as part of InToAsia Time-Based Art Festival (2015). Why do you think it is important for Southeast Asian art to be exhibited outside of the region? What has reception been like for these shows both from the artists themselves and for the audience in these cities? We have so far been fortunate with the reception of the shows both in USA as well as farther away, for instance, in Cambodia, Thailand, or where the artists were from. When I say positive reception I refer to the interest that the shows have generated. My foremost priority is the social engagement that the shows have achieved as a way to expand beyond regional boundaries. Some of these shows have caught the interest of both the press and the public interest. Reviews in international art journals or national newspapers have helped foster awareness and visibility of contemporary art from the region. There is little grasp of the art and cultures of Southeast Asia at the international level, so pitching shows and works that deal with local or Southeast Asian current affairs may not be easily understood outside the region. But this should not deter us. It is also important to consider where the shows were featured. In the case of the Queens Museum I cannot think of a better location with direct connections to various ethnic minorities living in Queens. During my stay at the museum we welcomed several school visits as well as the local audience who would step inside the museum while strolling Flushing Meadows, the park in which the museum is set. The works resonated with this audience, and for me this is the best result. At Sundaram Tagore Gallery in Chelsea and Madison Avenue, the audience is very different compared to that of Queens. They are well-travelled collectors that would have visited countries in Southeast Asia on business or vacation, so there too was an entry point to connect. 'Heads or Tails? Uncertainties and Tensions in Contemporary Thailand' (2017). Image courtesy of Sundaram Tagore Gallery, New York. How has the MA in Asian Art Histories from LASALLE College of the Arts, Singapore opened doors for you as a curator in terms of what you learnt in your time on the course, the connections you've gained and just having the degree? Having a degree simply to tick the box for the job was never in my mind. I pursued the MA at LASALLE and now at SOAS out of sheer interest to learn through research, and to engage in academic discussions that would help me do better in my job as a curator. LASALLE was fundamental in guiding me through an in-depth research on the Thai art scene and art education system, and those connections evolved into hands-on projects and exhibitions. I am now based in London, but during my time in Singapore at the end of my MA I found an accessible environment to start developing my profession as a curator and researcher. I left Southeast Asia four years ago but my connections there are still strong and thriving. You've been primarily based in London since 2015 and travel back to Southeast Asia for your projects. What does being located outside of Southeast Asia give you in terms of ideas and inspiration for your work on Southeast Asian art, do you think? I was not very keen to leave Southeast Asia in 2014 (not 2015) as I thought this departure would take me away from my research field. I was mistaken. If anything, it has provided me with the opportunity to widen my horizons and take a more holistic approach in my work. Being exposed to the art and culture in London is a true privilege, like living in an art volume of sorts. At the same time I visit Thailand as well as other locations in Southeast Asia three, four times a year so I can do a lot of ground research and studio visits. Combined with the culture I am exposed to daily based in the United Kingdom and Europe in general creates a good and unique arrangement that foregrounds my projects and research. You are currently pursuing a second MA at SOAS. What are you focusing on for this? And could you tell us more about how you think it will feed into your curatorial projects? It is inspiring to be part of a scholarly group of like-minded people at SOAS—akin to a decentralised Southeast Asia outside of Southeast Asia. The student body is diverse and many of the students come from various parts of Southeast Asia so we do share a lot in terms of common interests. My focus for this MA is primarily theoretical, however, as I have been interested in issues of displacement, mobility and refugee crises in Southeast Asia. In my research at SOAS I also take ethnography and cross-cultural courses that reference these topics. This wider knowledge constantly nourishes my curatorial projects, often going hand-in-hand. I have actually collaborated with other Thai colleagues in a Thai art festival in Bournemouth in 2015. For the festival we organised and curated the exhibition ‘Across the Ocean’ which aimed to draw attention to the shared cultural legacy of Thailand and the UK, which are separated in fact by the ocean. In 2017 with other London-based colleagues we founded SEA Currents, a platform for Southeast Asian art in London, helmed by a collective of artists, curators and researchers. These are the Southeast Asia projects I have been involved with in UK, and hopefully there will be more in the future. As an independent curator and researcher, what has been key to keeping the momentum going and realising projects, and what is the process like as a curator from coming up with a concept to opening a show? I can tell you about my work process, though this may not correspond with other independent curators. In general I am either asked to do a project for a specific space, for instance, a gallery invites me to curate a show, or I come up with a proposal that stems from my research focus, for a gallery or museum, like in the case of MAIIAM. For MAIIAM I started to discuss my proposal with Eric the Diaspora project back in 2016. He was interested in the topic, and welcomed the idea I presented. In general, once the space agrees to my proposal we start collating all the pieces of the puzzle, artists to select, possible new works to be produced and so on. Funding is often a challenge, so we curators need to think creatively. In the case of the Queens Museum show, I had to come up with the full budget to realise it. That was challenging. I had never done sponsorship packages. Luckily nowadays you find a lot of information online and the rest is common sense, work ethics and a bit of luck! Eventually I had a number of generous sponsors supporting the Queens show and that made the project possible. So the challenges vary, but one thing to remember is to never give up, to work rigorously and passionately, and the rest will happen! What exhibitions (or other projects) are you working on at the moment and/or what can we look forward to seeing from you in 2019? A couple of exciting projects are actually in the pipeline for 2019. The first one coming up is a solo show with Vietnamese artist Dinh Q. Lê at Tang Contemporary Art in Bangkok. The show will open early next year and features a completely new body of work that reexamines the effects of Agent Orange used during the Vietnam War.. I have known Dinh for some time and have always admired his work, so when the opportunity to work with him presented itself I was really delighted. As an artist Dinh is able to employ different materials to convey his messages, and his flexibility and multimedia approach is inspiring to me. Working on this project closely with him and Tang Contemporary Art has been very rewarding. What do you hope to achieve as a curator for Southeast Asian art? Throughout all my projects my aim has always been to foster and advance awareness of the cultures of Southeast Asia within and outside of Southeast Asia, and to debunk preconceived notions and taboos, tackling critical social and political issues affecting the region to advocate a counter-hegemonic and non-Western-centric discourse. To do so, I have based my practice on research, walking the ground, meeting artists, visiting studios, engaging with various communities, connecting with anthropologists, ethnographers, political scientists et cetera to gain a wider perspective and understanding. A cross-cultural approach is important for my practice, and I plan to continue to hone this in more projects to come.